The North Carolina Board of Nursing (NCBON) approves and regulates nursing education programs in the State of North Carolina. At this time, the Board does not approve/accredit nursing education programs which are outside of North Carolina jurisdiction, including out-of-state online programs/correspondence courses. The North Carolina Board of Nursing does recognize graduates from pre-licensure nursing education programs that are approved/accredited by other State Boards of Nursing as eligible to apply to take the NCLEX examination(s) and apply for licensure in North Carolina. For example, Excelsior College is one of these programs. Excelsior College is approved by the New York State Board of Nursing and graduates from that program may apply to take the NCLEX-RN Examination in North Carolina and apply for licensure as a Registered Nurse in North Carolina. 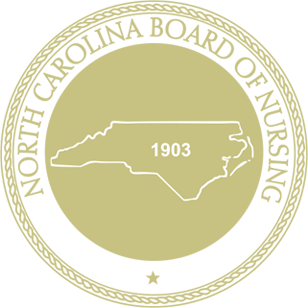 The North Carolina Board of Nursing encourages you to deal directly with the college. Out-of-State nursing education programs can be contacted directly for information and specific questions about the program and the program's approval/accreditation status in their state. It is recommended that individuals research the approval/accreditation status and credibility of any nursing education program before enrolling in individual courses or the entire program of study.